fatBuzz: Social Media Podcast 46 - BrewDog vs Diageo and the clear winner is...Goliath! Social Media Podcast 46 - BrewDog vs Diageo and the clear winner is...Goliath! This week a blog post promoted on Twitter became a global news story and it happened right here in Scotland. BrewDog, a small Scottish brewer, had a fight with the mighty Diageo. A genuine David vs Goliath and we decided Goliath was the clear winner! Listen to the podcast to find out why. Taking part in Social Media podcast Episode 46 we have Gordon White, Kyle Murdoch, Kirsty Hunter, Iain Murray and a special guest, Gillian Linch or latest intern. 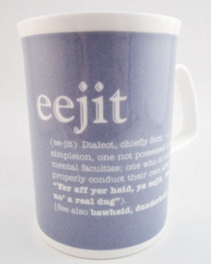 During the podcast Gordon uses the word "eejit" - a word printed on the mug he was drinking from at the time of recording: for the benefit of our overseas listeners, we though we should provide a definition of the word eejit. EEJIT (ee-jit) Dialect, chiefly Scot. ~n. 1. idiot, simpleton, one not possessed of all their mental faculties; one who is unable to properly conduct their own affairs. The new Facebook App store - Another place to find pointless Apps! Twello - A directory for businesses on Twitter - but, is this social? Quora - What's happened to it? Facebook Offers - The real debate is a nuisance and will it put people off Facebook? Google+ - Public hangouts or, should it be public hangings? Twitter - Were you one of the 55,000 whose data was breached? Pinterest - Is the spamming issue costing them users? Interactive Coat Hangers - Whatever next?